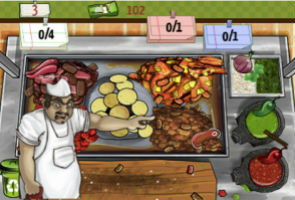 Taco Master, the creation of Mexican company Kaxan Games, is the world's most downloaded iPad application and among the most purchased software for use on other Apple devices at the iTunes store. Players take on the role of street vendors and try to make the highest-quality taco they can in the least amount of time, the president of Kaxan Media Group, Ricardo Gomez, told EFE. "It's very engaging and addictive and has received millions of downloads in more than 50 countries," Gomez said, adding that the game became the most downloaded application for the iPad just a week after it was released Aug 4. It also ranks among the top 10 most-downloaded applications for other Apple devices such as the iPhone and iPod. Despite its low cost of 12 pesos (97 cents), a pirated version of the application is already available and can be downloaded for free from some Web portals. "It's what always happens with the good games," Gomez said. "The kid who uploaded it even tweeted it on his account like some achievement. It's infuriating because they don't charge anything; they do it for the pure pleasure of 'hacking'," the company's president said, adding that the crime has already been reported to the authorities and is being investigated. "This action won't affect our sales that much because those who are used to downloading pirated software are going to keep doing it and those who aren't will keep (downloading games) legally," he said. Gomez said his company currently is making 15 video games for mobile devices and one for the home video game console Wii. Kaxan Media Group invested $4 million last year and has 120 game designers, according to Gomez, who said the interactive media company is Latin America's largest creator of intellectual property in the video game area.